Here you can download and save offline National savings of Pakistan Prize bond 25000 List 2019 & all Lucky Draw lists results in 2019 by savings.gov.pk online. Its not fair if we not shares some good information about the most charming High value and profitable Prize bond! Yes The 25000 Prize bond is the only one that have very reasonable amount of Prizes that each of us want to buy. The is 2nd high amount Prize bond in view of cost after 40000 Prize bond and Premium bond , so people love to buy it in the term to get the high worth prizes. Get some draw pattern and information about Prize bond 25000 List 2019 of this page here. The first prize amount is Rs.50,000,000/- (Five Crore Rupee or 500 Million Pkr) that is the very high amount for an ordinate person and we do not know what will we do after getting this high amount of Prizes. But this single first prize is for only one person and which of us will be lucky Allah Knows, but we should not got back and must try for this winning amount. The investment is little bit high but amount of winning prizes is also charming. Along with first prize of Five Crore Rupee, the 2nd prize amount of Rs.15,000,000/- (Dedh Cror or 150 Million Rupee) will be given to the three lucky people who come in the winning category. All the prizes are like Mouth water amount and each of us wishes to win this game. The first draw of this prize bond 25000 was held on 02nd May 2012 in Rawalpindi city and so on coming to the date with more and most winner’s announcement. The Twenty five Thousand Prize bond draw come after the three-month gap and in a year there is 04 draws that come in Feb, May, Aug and Nov of each year. This page is dedicated for Latest 25000 Prize bond list 2019 for the current prize bond draws of the year with upcoming draws that are being held in next day with city and date. You can get whole year draw list 2019 of Prize bond 25000 on this page along with the previous 07 years winning lucky number data on this page sorted out with year and months. 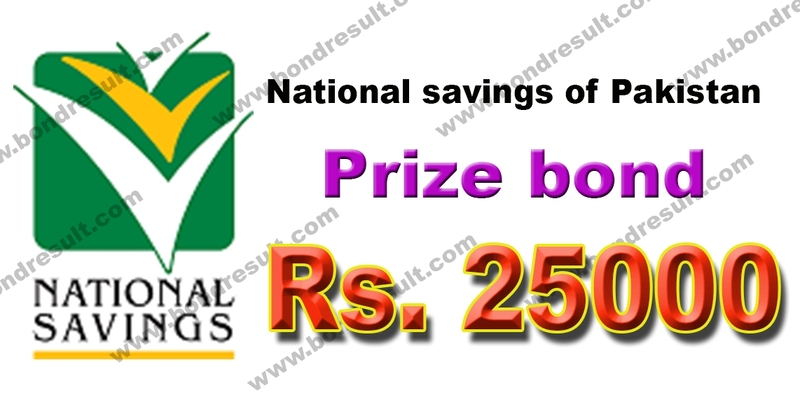 So find here all Prize bond 25000 List 2019 for the recent draw to today’s date by National savings of Pakistan.